Rediff.com » Movies » The Total Dhamaal trailer is hilarious! The Total Dhamaal trailer is a blast. We can't wait for the movie! The trouble with a hit series is that you want to keep making more installments. When Dhamaal became a surprise hit in 2007, Director Indra Kumar came up with Double Dhamaal in 2011. That did decent business at the box office. The films starred a long list of out-of-work actors and no script! Eight years later, he wove a script around the same characters and spun a new film, Total Dhamaal. The cast has changed this time. Sanjay Dutt has made way for Ajay Devgn, Anil Kapoor and Madhuri Dixit. There are some funny dialogues in the trailer. The best is when Devgn and Sanjay Mishra are in a car, which can give instructions in 'English', 'Hindi' and 'Chindi'! When the amazing Mishra explains what 'Chindi' is, it's hilarious. The rest of the cast -- Jaaved Jafri, Arshad Warsi, Ritiesh Deshmukh and Johnny Lever -- make you laugh out loud! The actors, including Anil Kapoor, prove their acting skills so efficiently that it's tough to say who's the funniest! 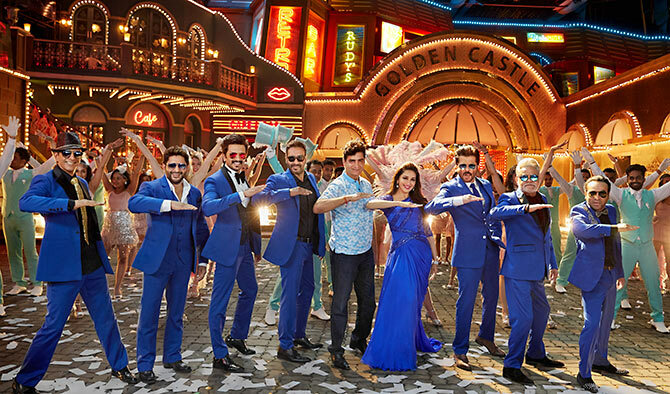 One wonders why Madhuri Dixit is added to the mix as she doesn't add any fun to the trailer. Let's hope the movie does her justice: Do you remember her hilarious turn in 1992's Khel where she played Ms Jadi Booti? The Total Dhamaal trailer is a laugh riot and worth a watch.